Create your own personal guides for Malta by clicking the icon in the top right corner. Coming to Eden Cinemas’ screens, an intimate journey into great performances by Roberto Bolle with exclusive onstage and backstage footage. 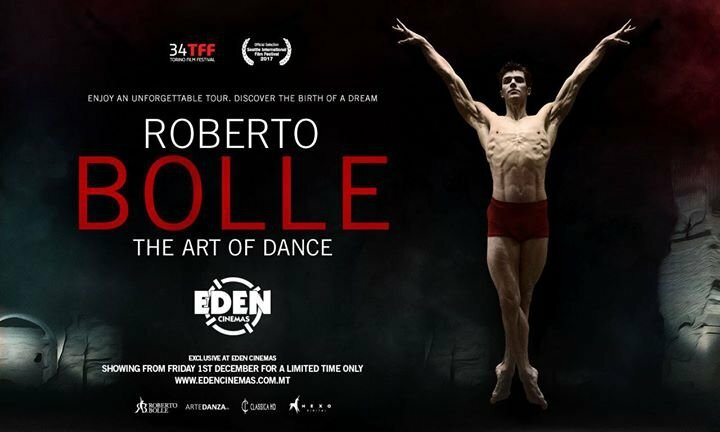 Roberto Bolle: The Art of Dance will premiere exclusively at Eden Cinemas on Friday 1st December at 20.15 and will show for a limited time only. Passion, charisma, classic harmony. Roberto Bolle has turned the art of dance into a popular genre: the Italian étoile has brought ballet closer to the general public, and through the beauty of movement, has been able to reveal the communicative power of dance in a truly amazing manner. Now his story hits the screens: Roberto Bolle - The Art of Dance, a film by Francesca Pedroni guides the audience through the 'Roberto Bolle and Friends' gala staged in three venues that are symbols of Italian cultural heritage: the Arena of Verona, the Teatro Grande at Pompei, the Baths at Carracalla in Rome. Patrons are invited for an extraordinary tour of Roberto Bolle’s great performances seen through exclusive onstage and ‘behind the scenes’ footage. This is a fantastic opportunity to move among all the emotions, fatigue, joy, and continuous confrontation that dance sets in motion with its dynamic energy. If you are a business in Malta and have an event to promote you can do it on My Guide at no cost. Login to create your guides for Malta. This guide has been created by a Malta Local Expert. The Xara Palace Relais & Chateaux is a one-of-a-kind 5-star boutique hotel in the impossibly beautiful medieval city of Mdina. Palazzo Consiglia has renovated a large Valletta townhouse into a luxury boutique hotel of timeless elegance. The Saint John is the first designer boutique hotel in Valletta for the renowned AX Hotels brand in Malta. The Citadella Boutique Living suites are on the doorstep of arguably Gozo's most important attraction - the mediavel old town centre of the capital of Gozo. All the three apartment suites within this small cluster are tastefully furnished and include all facilities for a comfortable stay such as airconditioning, free WiFi, flat screen TVs with cable and kitchenettes. The Knights in Malta B&B is a beautiful 300-year-old converted property situated in a historic street of the old village of Naxxar. Day’s Inn is a modern 3-star hotel in the centre of Sliema, a busy cosmopolitan town with a significant array of shops, restaurants and cafes. Its popular seafront promenade is within walking distance from anywhere in town. Zeri's is located in the beautiful settings of the Portomaso Marina, a luxurious development with a yacht marina that radiates the good life. Nan Yuan specialises in Cantonese food. This alone makes it a unique and exciting concept for Malta. Meats are cooked on a log based grill at Chukkas and definitely the house speciality. Patrick has been able to devise a winning formula of exquisite food, wide-ranging fine wines, striking decor and personalised service. Renowned for their famous rack of ribs and serves a Mexican inspired menu. In the evening turns into a happening and busy lounge bar club. Hugo’s Lounge may be found nestled in the heart of the hustle and bustle of Pacevilles nightlife. It was the first to introduce the sushi & noodle bar restaurant concept to Malta. Today its concept has expanded to cover a wider Pan-Asian food menu and is a go to place for an "all-in-one" lounge with great music, vibe and trendy crowd. Footloose is the place to have fun, jump around, possibly make a fool of yourself, but ultimately create memorable memories of wild and harmless craziness. ​Hugo’s Passion is situated above Hugo's Lounge right in the heart of Malta’s entertainment capital Paceville. This nightlife destination is a stylish venue both in design and atmosphere. The team behind Hugo’s Passion left no stone unturned to create a nightclub that goes beyond the norm and exceeds expectations through its authenticity and unique style. Hornblower Cruises is a great way to discover the natural beauty of Comino and Gozo whilst enjoying the facilities of this spacious 33 metre vessel. Handpicked by a Malta Local Expert, we bring you our guide to 'Top 5 Luxury Hotel Resorts in Malta'. Handpicked by a Malta Local Expert, we bring you our guide to 'Top 5 Family Friendly Hotels in Malta'. Handpicked by a Malta Local Expert, we bring you our guide to 'Top 5 Boutique Hotels in Malta'. Handpicked by a Malta Local Expert, we bring you our guide to 'Top 5 Self-Catering Stays in Malta'. Handpicked by a Malta Local Expert, we bring you our guide to 'Top 5 Value & Budget Lodging in Malta'. Handpicked by a Malta Local Expert, we bring you our guide to 'Top 5 Maltese Cuisine Restaurants'. Handpicked by a Malta Local Expert, we bring you our guide to 'Top 5 Fish & Seafood Restaurants in Malta'. Handpicked by a Malta Local Expert, we bring you our guide to 'Top 5 Pizzerias in Malta'. Handpicked by a Malta Local Expert, we bring you our guide to 'Top 5 Ethnic & Asian Restaurants in Malta'. Handpicked by a Malta Local Expert, we bring you our guide to 'Top 5 Steakhouses in Malta'. Handpicked by a Malta Local Expert, we bring you our guide to 'Top 5 Restaurants with Views in Malta'. Handpicked by a Malta Local Expert, we bring you our guide to 'Top 5 Bars and Pubs in Malta'. Handpicked by a Malta Local Expert, we bring you our guide to 'Top 5 Night Clubs in Malta'. Handpicked by a Malta Local Expert, we bring you our guide to 'Top 5 Diving Centres in Malta & Gozo'. Handpicked by a Malta Local Expert, we bring you our guide to 'Top 5 Historic & Cultural Attractions in Malta'. Handpicked by a Malta Local Expert, we bring you our guide to 'Top 5 Activities in Malta & Gozo'. Handpicked by a Malta Local Expert, we bring you our guide to 'Top 5 Tours in Malta & Gozo'. Click here to request a new featured guide for Malta from your Local Experts! My Guide Malta is part of the global My Guide Network of Online & Mobile travel guides. My Guide Malta is part of the global My Guide Network of Online & Mobile travel guides. Our Complete Website Solution frees up the time, cost and technical expertise required to build and operate your own successful online travel business. Sign up for our mailing list to get latest updates and offers for Malta.